Rubber Expansion Joints are now available from Motive Traction . These devices are typically positioned at the end of the system (at the connections to machines or cubicles), along the system when switches are inserted or when a removable expansion is required. 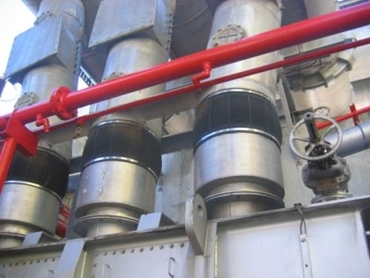 Applications that usually require rubber expansion joints include use within power plants, refineries, petrochemical plants, large scale farms as well as the paper and sugar industries. The rubber expansion joints enable the continuity of the seal between the end of the envelope and the aluminium sleeve fixed on the flask of the machines. They also offer electric insulation between these two mechanical parts and enable a thermal dilation while simultaneously absorbing the machine vibrations.